The second garden horseradish plant was dug and processed for making horseradish condiment. My intent was to process into powder and make the condiment as required to have it fresh, but I found it impossible to dehydrate so abandoned the attempt and referred back to the tried an true method. The roots were washed in a home clothes machine, this is sufficient for the operation. The discoloration is swamped and not visible. The small root pieces were blended in a tall container with a hand blender. Water and vinegar are the conventional liquids used. After blending the excess liquid is removed. The very hot tasting condiment is kept in a closed jar in the refrigerator and keeps for 2 to 3 weeks without deteriorating. The excess roots were vacuum packed for storage. Vacuum packed produce must be stored in the freezer for long term and in the refrigerator for short term. Vacuum is not a storage/preserving method. Pictures depict the process. 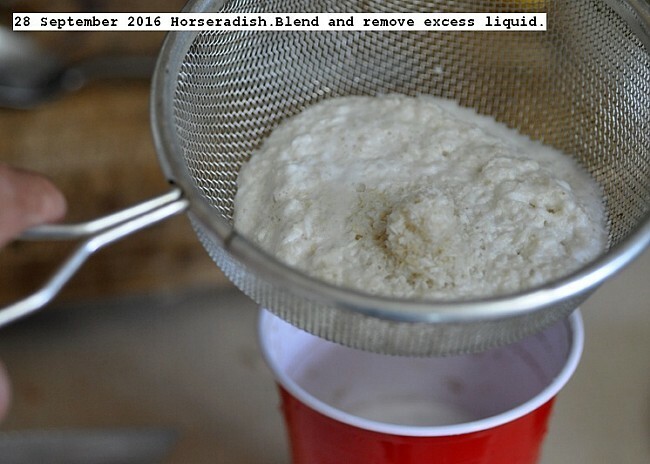 This entry was posted in Uncategorized and tagged 28 September 2016 Horseradish (Processing), Horseradish, Horseradish Condiment. Bookmark the permalink.